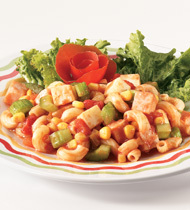 Check out our Festive Turkey & Macaroni Salad recipe made with Campbell's® Healthy Request® Condensed Tomato Soup and Pace® Mild Chunky Salsa. 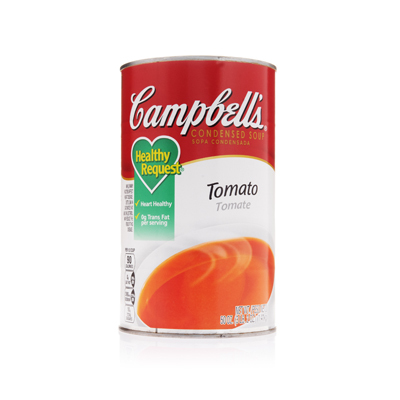 Combined with lemon juice, macaroni, turkey, Swiss cheese, celery, and corn. This is a simple and easy side dish that can be prepared in under an hour. elbow macaroni, dry	 83 oz. cooked turkey, diced	 8 lb. Swiss cheese, diced	 5 lb. whole kernel corn, drained	 3 qt. 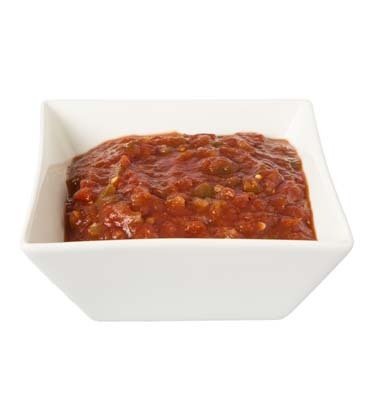 1.In large mixing bowl, combine soup, salsa, lemon juice and pepper. Mix well. 2.Prepare macaroni according to package instructions. Drain and cool. Add macaroni, turkey, cheese, celery, and corn to soup mixture. Mix well. 3.CCP: Refrigerate below 40°F for service. 4.Portion 8 oz. using a rounded No. 6 scoop. whole kernel corn	 3 qt.